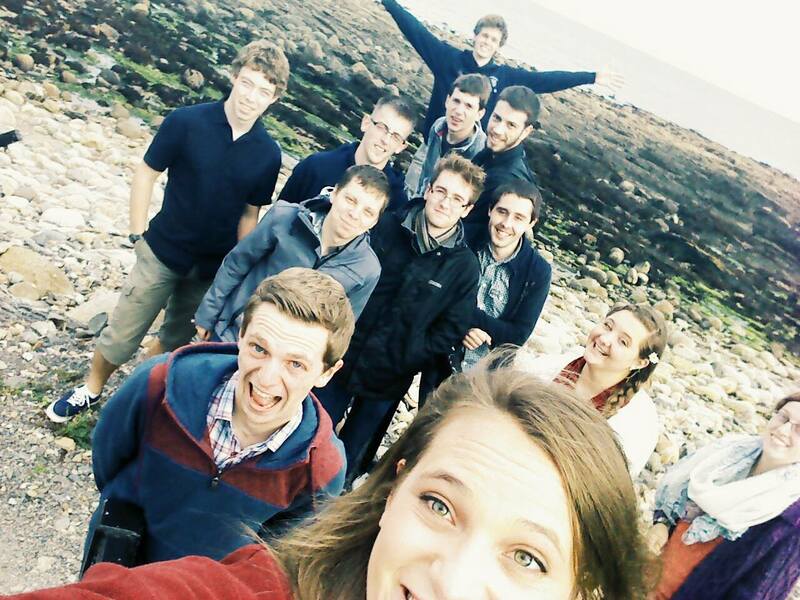 Two weeks ago a team of young Americans landed in Ireland for the Young Adults Weekend. What they didn’t realize was that for an entire day they would have nothing to do until their boat left for Scotland. So what do they do with all that free time? The fantastic five hopped on a tour bus around Belfast. For a nice 10 pounds they were able to get a hop-on-hop-off tour of the capitol city. The ride was not the greatest in the world: the students managed to get a cloudy, chilly, windy day. When the bus hopped on the highway, the wind was blistering cold. Most of the students huddled together as penguins in Antarctica. 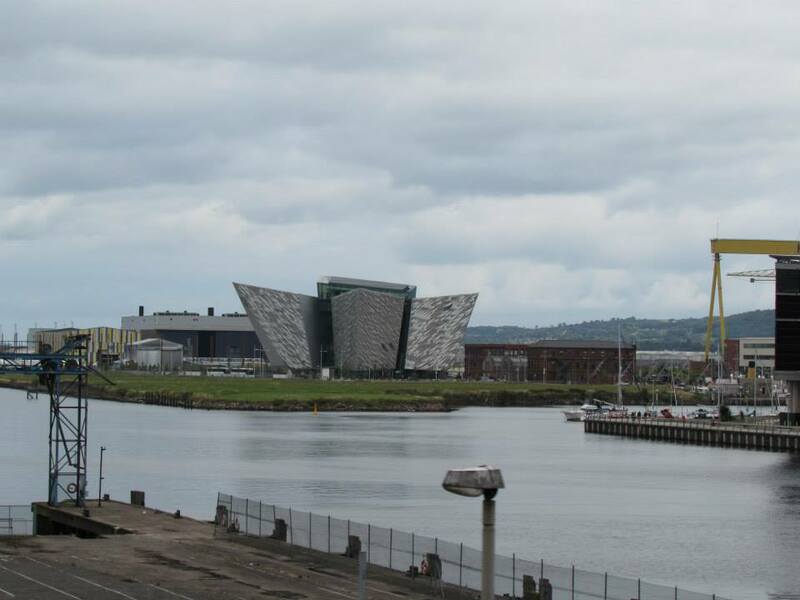 Yet, in spite of the freezing experience and the tour guide’s bland jokes, the brave students saw beautiful murals from the “Troubles”, when Northern Ireland faced turmoil in the midst of its cities. From 1968 to 1998 (approx. 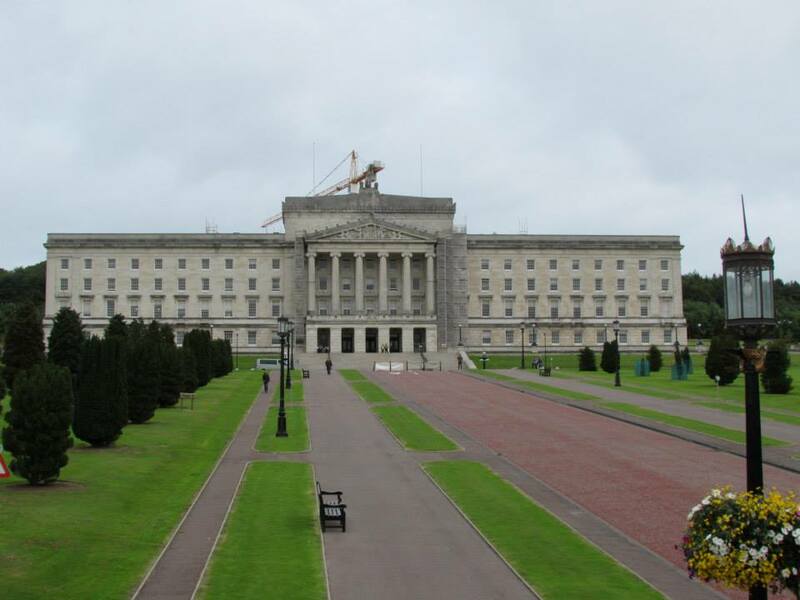 ), groups of Protestant Irish and Roman Catholic Irish feuded in the streets of Belfast (along with other areas of the country). Both sides used various weaponry to terrorize the other side, including bombs. The quintessential quintet passed by several street where simple shops and bars were bombed for little reason than one side making a statement. During the thirty years, Belfast constructed a gigantic wall between the Protestant and Roman Catholic sectors. The students took several photos of the site, of which a major part still stands, and five gates between the sectors are still in operation (four of which routinely close at sundown). Other sites the quirky quintet quickly passed by: the quiet old jail house, the quaint capitol building, the giant yellow cranes, Samson and Goliath, registered as landmarks that were so tall it made your stomach queasy, the Titanic museum at the yard where the massive ship was built and passed all the qualifications (as the Irish say, “It was fine when she left!”), C.S.Lewis’ boarding school where one could not count the quantity of lampposts lining the property, and the Botanical Gardens right next to Queens University. The last stop of the day was visiting a reading room of the Queens University library that is dedicated to C.S.Lewis. 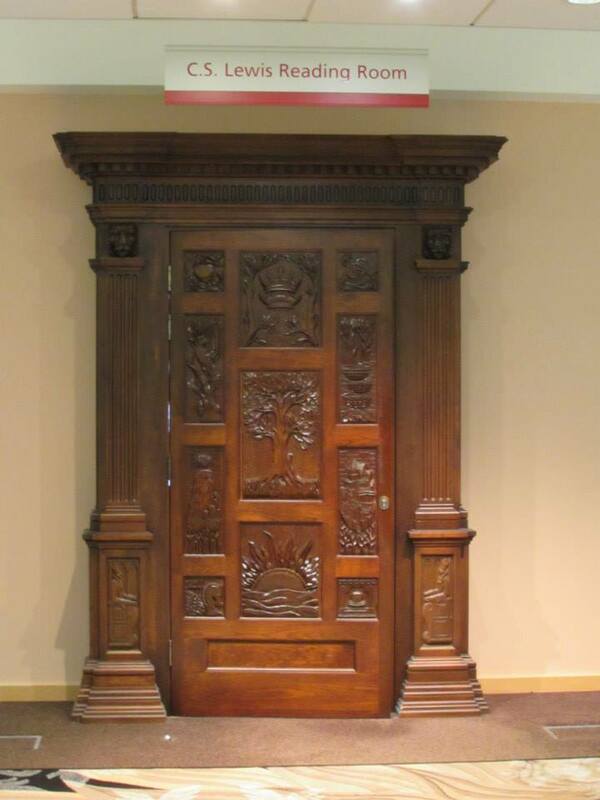 On the second floor of the modern library, the wooden door to the wardrobe from the book The Lion, The Witch, and The Wardrobe resides magnificently in a wall with a massive rug with Aslan in front of it. Step through it, and you enter into a small, quiet room with a table containing the map of Narnia and windows with quotes from C.S.Lewis’ various novels. It stole the breath of the tired team of students. After the visit to the reading room, the crew hopped on a ferry and rode the waves back to Scotland, to continue their adventures in Scotland. Once in the land of the kilts, the team of rested students diligently tackled their reading assignments. With 18 chapters to complete, they had their work cut out for them. While very formative for their faith, the size was daunting. They wrestled with Reformed doctrine, muscled through Calvinism and T.U.L.I.P., frolicked through the delightful fields of spiritual disciplines, and sat under the historian sharing stories of the Apostle Paul’s life. 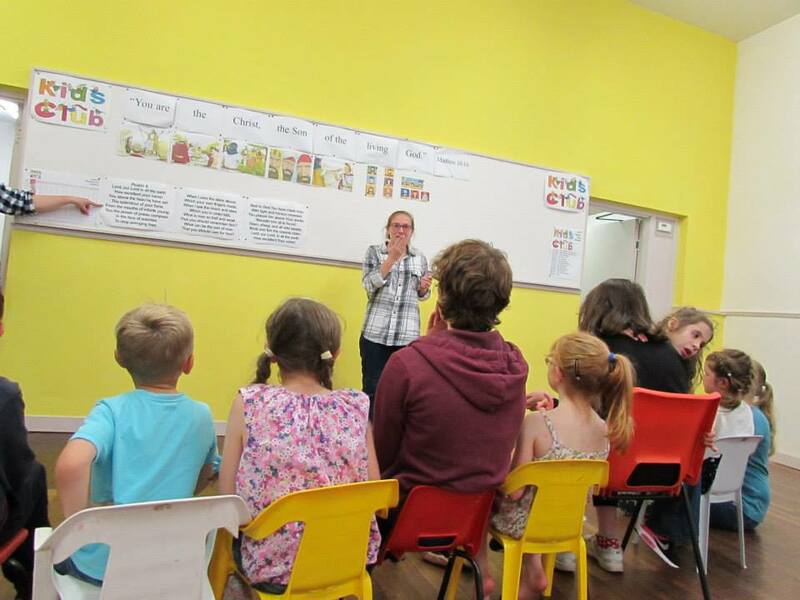 To end our week, the first Kids’ Club of the semester was held at the church. It was a blast to spend time with kids, who, while very hyperactive, could not hide their delight in seeing new people to befriend. The kids learned about how Jesus healed blind men, and the fantastic five assisted in the crafts, snacks, and games. 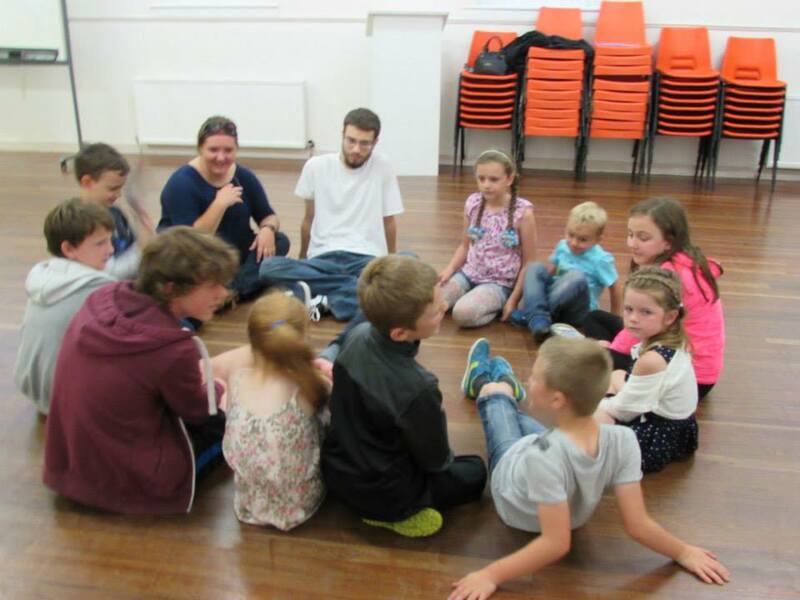 After Kids’ Club, the Covenanter Youth began, which was for anyone over the age of ten (in other words, everyone who was too old for Kids’ Club). The team and the kids went out and got ice cream at one of the best tasting ice cream shops in the world (as one of the students would testify). When everyone returned to the church, the two men of the quintessential quintet decided to built the best mattress fort ever. And they succeeded. After the fantastic fort frenzy, the youth played a fun game of sardines (or as some call it “Reverse Hide-and-go-seek”—one person hides, and the others seek him/her out, and once a person finds him/her, that person hides with him/her). After that, all the kids were sent home. And thus another week of adventures ended. Turn in next week for another exciting addition to quintessential quintet’s adventures in Scotland! I am so excited to be here in Scotland for my last semester of college! I’ve been dreaming of doing the Semester in Scotland programme for 10 years, and now I have the opportunity to live that dream. You see, my sister participated in it 10 years ago, and the summer before she came, my parents, and my little sister, and I flew to England for my cousin’s wedding. While we were on this side of the pond, we drove up to Scotland to see where she would be staying for four months. I fell in love with the people I met and the astonishing scenery I saw. This year is promising to be just as exciting as my first week in Scotland was a decade ago. It’s been three weeks since I arrived, and I’ve already learned and seen so much. This week, we attended the Airdrie RP church on Sunday and had lunch at Stacy and Fraser’s. They are a lovely young couple who fed us a great meal and provided great fellowship (and their puppy, Milo, is adorable). In the evening, we went to church and afterwards went to Stephen and Brenda’s for tea and some friendly discussion on various topics. Classes went well during the week, albeit not on the regular schedule due to an unforeseen event that popped up and a weekend retreat. One of the advantages in this program is that the teachers are all flexible, so if something comes up, they can easily adjust their class. Also, even though there’s a lot of reading to do for the classes, we have scheduled times to get some of it done, which is really nice. Wednesdays are my favorite because in the afternoon we get to go see various sites in the country. This week, for our Wednesday trip, we went to three places. First, we visited the site of the Battle of Bannockburn where Robert the Bruce defeated the English and took back Stirling Castle. Then, we went to a 900 year old Abbey where we saw the grave of King James III of Scotland and his wife, Margaret the Princess of Denmark. 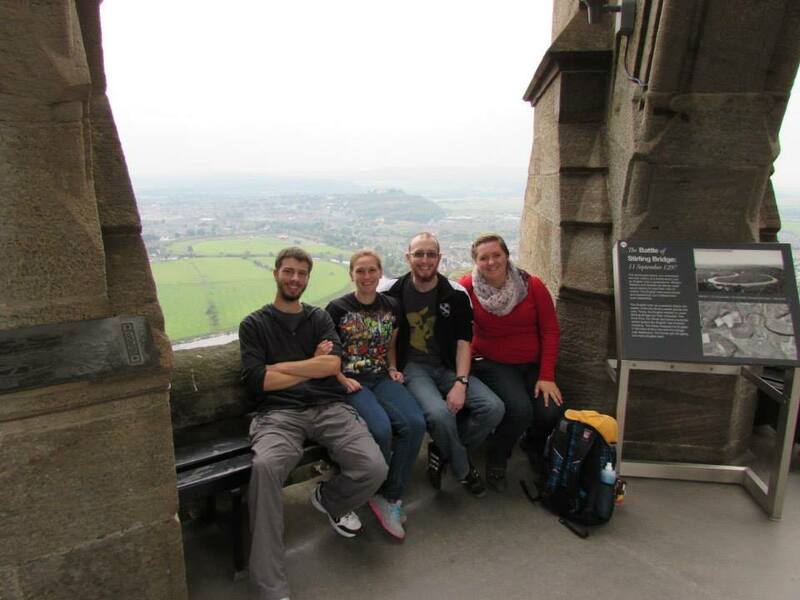 Finally, we went to the Wallace Monument that was put up in honor of William Wallace (aka Braveheart), who fought and died for Scottish freedom, and we climbed the 246 steps to the top of it for an amazing view of the landscape below. We finished the day with our MET and went back to our respective homes. Friday, we got up early to catch the ferry for Northern Ireland for the Young Adult Weekend (or YAW for short). The trip was uneventful and we arrived safely. 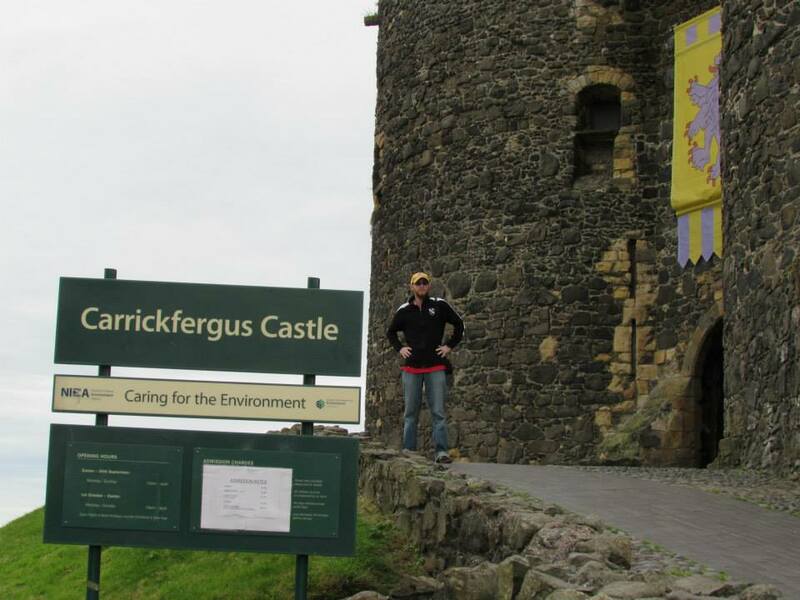 We were picked up by the Loughridge family who fed us lunch and then dropped us off at the Carrickfergus Castle for a couple hours. The view from the lookout tower was over the Irish Sea, and it was beautiful! It was fun looking around there and seeing the different rooms too. We found one room that used to be used for processing meat that had a mural of a butcher on one wall, and the rest of the walls were painted white. (The weird part was that there was also a pillory set up in the room. Not sure why it was in there). 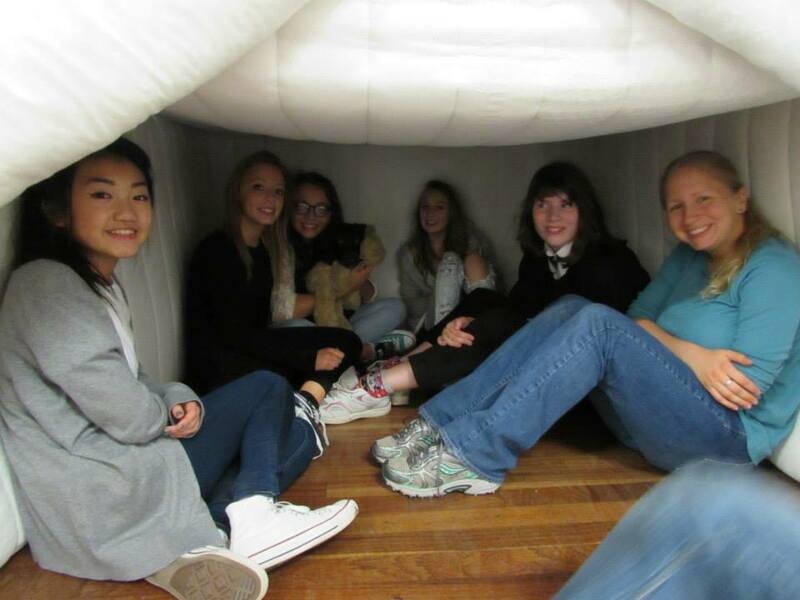 It had a curved ceiling and great acoustics, so we stayed in there for a bit and sang some Psalms. When it was time to go, we rode with the Loughridges to Annalong, Northern Ireland for the YAW. The talks at the retreat were quite good and were about God’s covenants with Adam, Abraham, Moses, and Jeremiah. Between talks, we had meals and free time and seminars. The place we were staying was a farm/conference center called Mullartown House. It was only a short walk away from the Irish Sea and so during the free time in the afternoon, David and I would walk to the beach. It was glorious. It wasn’t a sand beach like they usually are in the States, it was a rock beach with a fantastic view of the Mourne Mountains. I took many pictures and had a fabulous weekend. Sunday night we stayed at the Loughridge’s, and Monday we went to Belfast and got a bus tour (where I took many, many more pictures). Then we caught the ferry again and returned to Airdrie in the evening. These past three weeks have flown by. It seems like only yesterday I was trying to figure out what to pack and how to fit it into one suitcase so that it would weigh less than 50lbs. All of the reading material and the classes are extremely thought provoking, and I am so happy I have the opportunity to study here. I can tell that God is working in my life here, and I’m excited to find out what the outcome will be at the end of the semester. But for now, I’m just going to take it one day at a time and enjoy the ride! Cheerio! 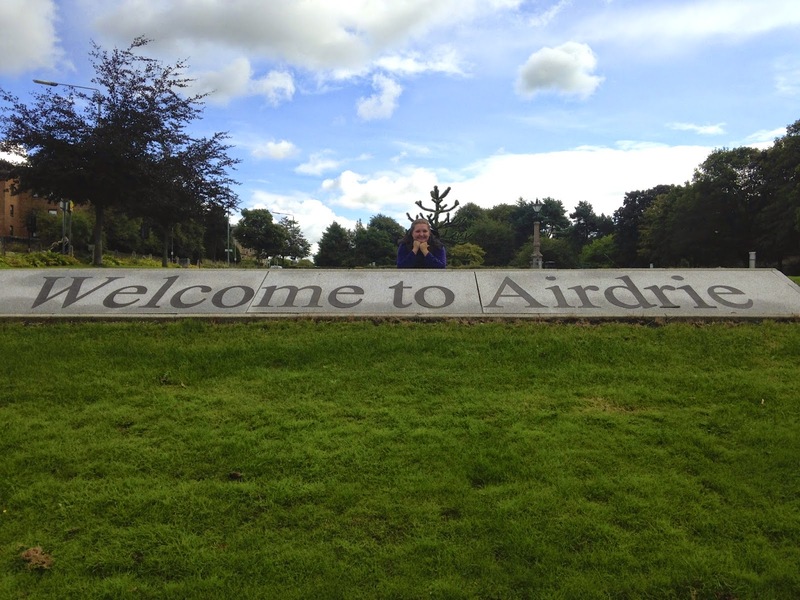 In the bright and early morning of Tuesday, August 19, one of my fellow classmates and I arrived at the Glasgow airport and were driven to Airdrie, our new home for the next four months. We waited for the other three of our classmates and had a wonderful dinner provided by the Quigley family! They are so hospitable! We all slept a lot the next day to catch up on lack of sleep and jet lag. While the boys slept, the girls went to breakfast in a flat owned by a couple from the church. To them it may have been a small gesture, but I know to me, it was an extremely welcoming and encouraging glimpse of the community of believers we would be joining for the next four months. When the boys woke up, we went grocery shopping. That evening we got to meet another couple from the church, and we were welcomed into their home for a yummy dinner. These first two days definitely helped us to start off our time here well! On Friday, Rosie and I took our classmates out to explore Airdrie a little bit (since she and I had done a little exploring before). We invited Karen, a member of the church, over for tacos for dinner and we had a mini photo session! After dinner, Karen graciously took Rosie and I out on a walk on some gorgeous walking paths. The beauty in Scotland is everywhere! I could not believe the mixture of gorgeous sunset, green trees, and picturesque hill scenes! On Saturday, Rosie and I explored Airdrie a little bit more and found a super fun playground! Then some of the crew and I watched the Doctor Who Premiere, IN SCOTLAND!!!! Monday we began our class work, by reading for the two lectures we would take on Tuesday. Tuesday we had our Church Ministry seminar and our Paul seminar. Wednesday, we were unfortunately not able to have our Systematic Theology class, but were greatly looking forward to having it next week. 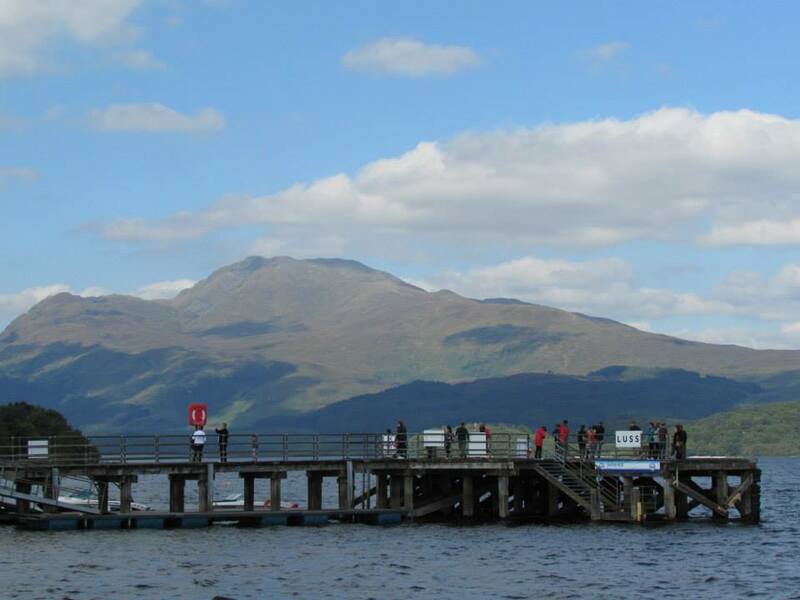 Then in the afternoon Jimmy and Helen, a couple from the church, took us to Loch Lomond. It was so beautiful! Wednesday evening, the girls attended a MET (Mutual Encouragement Time) – we are studying the book of Nehemiah. 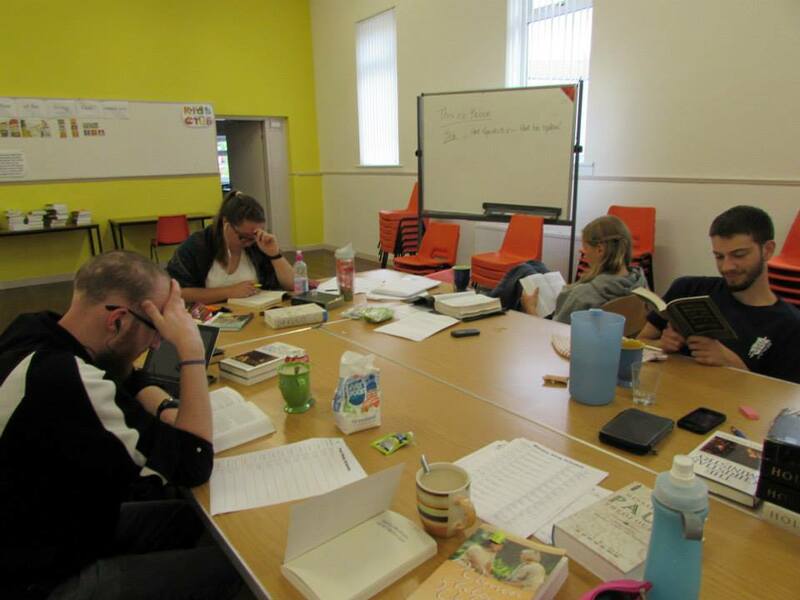 On Thursday, we had some more study time and then we had our first Reformed Evangelism seminar. Next week we will start our Scottish Covenanter History and Theology course. On Friday, we had another study day. On Saturday, we all slept in again. 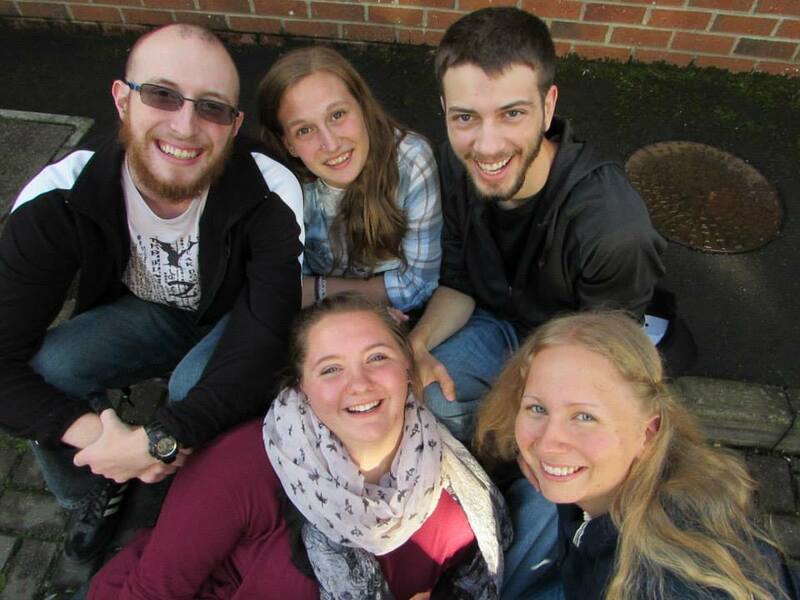 Then we worked on some studying and we spent some time together before the group that watched Doctor Who last Saturday huddled onto a couch in the girl’s flat and watched the newest episode. 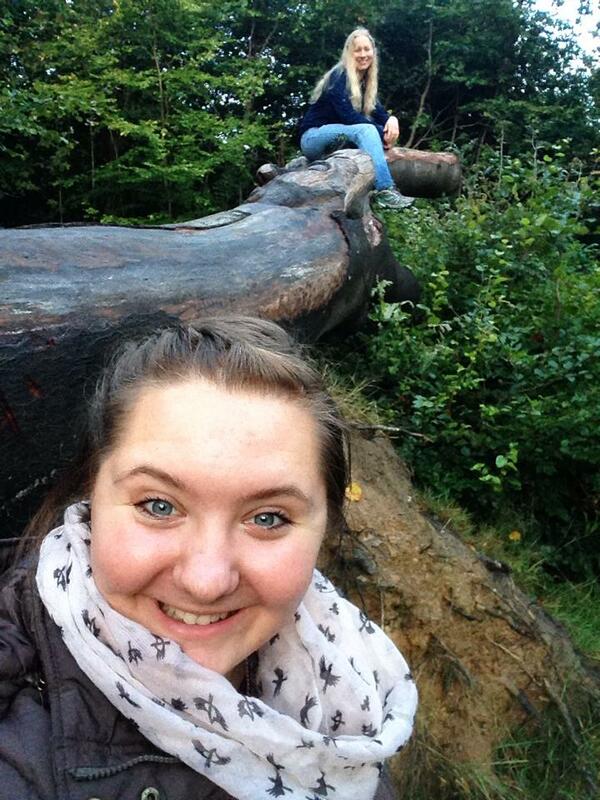 So far my time in Scotland has been amazing! Not only am I experiencing a completely different country, I am also growing spiritually and being stretched. I know that this coming semester will be one to never forget!